I’ve written about pastrami short ribs, and love them because they’ve got the perfect meat-to-fat ratio. But ever since the arrival of a Big Green Egg (planning a review soon), I’ve wanted to do a proper pastrami, which is essentially a corned beef brisket, coated with pepper and coriander and smoked (the result above was perfect—look at that awesome fat). While I’ve published the corned beef recipe from my book Charcuterie, I haven’t really talked about smoking strategies at home. I recommend two different methods: stove top and in a kettle grill. Stove-top smoking is easy with an inexpensive ($43) Cameron smoker. I bought one a few years ago and it works great for bacon and would work great for this brisket. Briskets require long low heat though, and this is tricky on a stove top smoker. So this is what I do when I want both smoke and long slow cooking. I smoke the meat for a couple hours. Then I transfer it to a 200 to 250 degree oven to finish. With this pastrami, I would cook it in the oven for 30 to 60 minutes to bake the smoke on, and then cover it with foil and 1/2 cup of water and cook it for another 2 to 4 hours till it’s tender (the water is to make sure there’s plenty of steam). Smoking is a great and fun way to flavor foods. I love the cherry or any fruit wood for bacon, and a hardwood like maple for this brisket. My post on corned beef with braised cabbage and red potatoes and another post on brining. This is one good looking sandwich the chipped ‘della dog by Ideas in Food Aki and Alex. The Fresh Loaf has a Jewish sour rye bread recipe which goes well with pastrami. David Sax explores the Roots of Deli Meat, which appeared in Saveur Magazine. As an observant Jew, not cooking on the Sabbath always gives us issues with what to serve on Saturday lunchtime…Recently I’ve heard of people putting up a pastrami Friday night (before sundown) and letting it “cook” for 14 hours or so (probably from like 6pm to 12pm the next day) is there any way this is even conceivable to do? And I was curious, if the oven is on the lowest setting, and the pastrami is covered tightly, do you think I can let it smoke in the oven for that long? or would it be too long? I would smoke it friday, then put it in a 200 degree oven with a half cup of water, covered, for 14 hours. It will be fab! Michael, you are totally my hero! Have you heard of Montreal Smoked meat? I am guessing it would be like a pastrami, but maybe cold smoked instead? It is all the rage up here, and I would LOVE to whip out something like this for the relatives. It would be the BOMB! There should be no problem with letting it cook overnight in an oven, you should keep an eye on the temp with a thermometer with a probe and pull it out when the meat gets to 195-205 or so (that’d be a good temp for sliced brisket, I’m not sure how pickling the meat affect the done temperature). I’d then wrap it pan and all in an old towel and put it in a cooler. It should keep the brisket above 145 for a few hours until you’re ready to slice and serve it. this would work but i think my idea is easier! I’ve made the Charcuterie pastrami recipe a few times and it’s always incredible. Refridgerating post-smoke and then steaming makes a big difference. Any problems with this being too salty? When prepared as corned beef it is cooked in water which should leach some salt. When smoking none of that salt would be removed. Thanks for the recipe. This is a 5% brine and should be ok. If you’d rather, reduce the weight of the salt to 1.5% of the water and brine for 10 days. You can’t over salt this way. If you do over salt, anything, you can cook it in some water before serving to leach out salt, or soak overbrined meat in fresh water for as long as you over salted. When the pastrami is put up on Friday for Saturday lunch it is a vaccuum pack and they keep warm in water until the morning. I find this revolting. You end up with a peppery fat bomb. If you want authentic fresh brisket pastrami on Saturday morning I would suggest buying a whole brisket with lots of fat and prepare it with the brine and the rub suggested here. (it would take a bit longer to brine a whole briskety) You could them put it in the oven on Friday afternoon at 200 and the fat will keep it moist until the Shabbos meal. 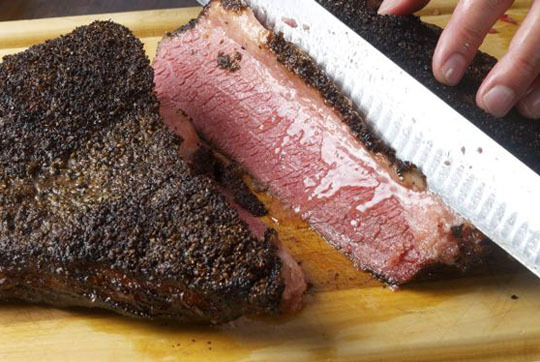 My favorite pastrami, especially home made, comes from the navel of beef. Beef navel has an almost pork belly level of fattiness, so it would certainly qualify as fatty. I used the recipe from Charcuterie and it came out really well. TW…. I made the charcuterie pastrami 3 weeks ago for the 1st time and 6 of us ate a 6lb slab. It was awesome. Highly recommend it and its very easy to do. I use the smoking sticks that Korin imports to do a cold smoke on Pastrami, then hot smoke it with Pimento wood chips. Pimento wood (the allspice tree) has become my go-to hot smoking wood. This looks great! But I’m surprised that only 2 tbsp of pepper/coriander is supposed to cover a 5-lb slab of meat. Especially if it’s supposed to be as thick as in the photo. yes, it should suffice. but why don’t you make double, then keep what you don’t use for an all-purpose meat seasoning, works with all red meats. Don’t forget to crank that egg up to 700 degrees and make some pizza! Looking forward to your review of the “Big Green Egg”. I’ve been wanting to get one, but a little intimidated by the price! I have another of your recipes for corned beef, Michael, pretty much the same but not the one for the corned beef & cabbage. I don’t remember where I got it, but not this blog. Magazine? (I wrote “Ruhlman” at the top.) Anyway, your pastrami short ribs are still a favorite of mine & my guests. Thanks for it & also for the corned beef! Can you pass along any kosher corned beef hints from the fabulous delis of NY & Chicago? Their corned beef is out of this world & here in Seattle no one knows what I’m talking about. You guys are talking about five pound slabs so I’m assuming your talking a small flat and certainly not a packer brisket. The problem I find with that is that most “flats” have been trimmed to death leaving hardly any fat or fat cap to speak of. true, it’s so damned lean these days. Mr. Ruhlman, I have a question but it’s not about brisket. I used your recipe to make preserved lemons. How long will the lemons keep in the salt? Thank you. as long as no air is touching them, they’ll keep longer than you will. I’ve had excellent results but with the short rib pastrami, but I have to question the recipe a bit. If you’re smoking on the grill–I assume at 225 degrees–2 hours seems like a really short cooking time. Either you’re cooking it on the grill (and not using prime smoking temps) or you are dangerously undercooking the brisket. My experience with Texas style brisket is that it takes about 90 minutes per pound, or about the amount of time you suggest for the oven brisket with a 5 pound brisket. In your book you recommended a Bradley smoker (I have a new one and I really enjoy it). Are you not recommending it anymore? I did try pastrami on it and it came out very good. Glad to hear there’s a review of the BGE coming soon. I hope you’re enjoying it. We’ve had ours for close to 15 years and love it. I keep thinking I want to add a brick oven to the back yard, but the BGE can act as that as well. Last night I was making ragu bolognese and you were leaning back in a bar stool with your feet propped on my work surface. I was glad to have you there, I was less happy about the feet. I should guit having dreams. I, too, am not fond of the “flat” brisket, and find it over trimmed. I buy the whole brisket, with a fat cap, and trim it down myself until it’s closer to about 1/2 – 3/4ths of an inch thick instead of a super thick slab. I brine fat-side down and give it a little extra time. I smoke it outside on a big barrel-style Charl-Griller smoker with a side firebox, and I used smoking CHUNKS, not chips. Chunks last longer. You can buy wood in logs, chunks, and chips, and add another chunk or two every couple of hours. I think I let my pastrami cook for about 8 hours or so and made sure to leave the fat side UP when smoking so that the fat would trickle down into the meat to keep it moist. You have to stick a probe thermometer in it and just leave it alone – don’t go opening the main section of the smoker, don’t go poking the meat. Don’t flip it. Just leave it be. I start my coals with a charcoal chimney and NO lighter fluid. Some people say they can’t get one of these things started. The trick is to take newspaper and roll it diagonally into logs, then shape the logs into rings inside the bottom of the chimney. Once I learned this I never had another problem getting a fire started with a single match – and no singed eyebrows. Ruhlman – the Egg will hold temperatures as low as 170F for 36 hours pretty easily, so it’s perfect for making stocks, confit, etc. I just finished a Charcuterie-inspired pork belly confit on the BGE that is absolutely *delicious*. What timing! I just made your corned beef brisket last night. I cooked it using an immersion circulator for 72 hours at 140F. It was an amazing texture. I can’t wait to make a rueben. This photo looks too amazing. Weekend at home must try. ruhlman I have to respectfully disagree that wood chips are better for coal smoking than wood chunks for “long steady smoke”, Nice try though. You should have used your new green egg and wood chunks for this instead! Michael, very excited to try this recipe on my new big green egg! I bought my brisket at a kosher butcher, do you think there is any need to scale back on the salt for a kosher vs non-k piece of meat?? I made the brine, brought home what I thought were boneless short ribs from a stand at WSM and now when I unwrapped them, ta – da- daaah they’ve got bones. Can I still continue with the pastramied short ribs? Just wondering if the bones will do anything weird to the brine or vice versa? Or do I need to de-bone them? Thanks for the info and congratulations on the new book. Now that is an interesting fire trick I have not heard before. You get that out of one long burn or do you add coals? What size BGE do you have? Funny enough, I had a brisket in the ‘fridge in the middle of corning, ready to come out. I smoked it using indirect heat on my kettle grill. It came out perfectly! I always thought that pastrami — at least the classic NYC version — was cold smoked, then steamed to cook it. Am I wrong? It’s certainly more difficult to cold smoke at home without a special smoker, as you need to maintain temps under 90 degrees. Also, I have followed Beard’s recipe for pastrami from “American Cookery” that dry cures the pastrami. He uses ginger, garlic, and pepper in the cure, but you could grind any pf the picking spices and mix them in. I like this method because it provides a degree of separation from corned beef, which I brine. It must be simmered after cold smoking to get rid of the excess saltiness. Has anyone else has poor results when using charcoal (matchlight, etc…) combined with wood chips when smoking? My bacon had a very odd taste to it that I assume is from the type of charcoal. Did anyone else run into this? I made the switch to just chips and used gas to keep the smolder. Obvious I know, but still curious. that definitely sounds like the charcoal. try using lump charcoal and a chimney to light it. Michael, I’m confused regarding the brining ingredient amounts here vs the ones for the pastrami recipe in Charcuterie. The recipe here has half as much salt and sugar, but recommends (potentially) an even shorter brining time than in the book. Am I missing something, or did you perhaps decide the brine recipe in the book was too strong? Apologies if this question has already been addressed–I didn’t see this point addressed in the comments so far. the recipe from the book works fine. I’d prepare it by cooking it in an inch of water as described in the book. my brine is lighter because it’s never cooked in water, which leaches out some of the salt. Wow! That pastrami is making my mouth water! I must try this. Anyone have pictures of the brisket after brining and before cooking?What happens if you don’t brine the brisket long enough? The “PINK SALT” you speak of in your recipe is Prague powder and it is necessary since it retards spoilage so from a safty standpoint it should not be left out. Also you say Pastrami is just Corned beef that has been smoked–wrong—Corned beef has pickeling spices in the brine and if you are doing Pastrami they are left out of the brine..
Kosher Blog » Archive » Home-cured pastrami – for Shabbos!